Pelias was one of the mythical kings that appeared in the stories of Greek mythology; indeed, Pelias was a king who appeared in one of the most famous tales of Ancient Greece, the story of Jason and the Argonauts. In ancient literature, Pelias was the adversary of Jason, the king of Iolcus, and the man who set the youthful hero the impossible quest for the ﻿Golden Fleece﻿. Two tales are told of the lineage of Pelias, the less fantastical version tells of Pelias being the son of Cretheus, the king of Iolcus, by his wife Tyro, a princess of Elis. A second tale though tells of a different parentage, more in keeping with Greek mythological tales, for it was written that the father of Pelias was in fact the god Poseidon. Tyro was said to be infatuated with the Potamoi Enipeus and would often visit the physical river that the river god represented. Poseidon spied the beautiful queen and so assumed the form of Enipeus, and subsequently lay with Tyro. The brief liaison saw Tyro give birth to two boys, Pelias and Neleus, but these two sons did not go to live with Tyro’s other sons, Aeson, Amythaon, and Pheres, in Iolcus, for Tyro was ashamed for what she had done. Some sources tell of Pelias and his brother being left to die on a mountain, but were subsequently rescued and raised by a keeper of horses, and some said that the two boys were given over into the care of Sidero, Tyro’s hateful stepmother, but in either case the pair grew into adulthood. It was then that Pelias and his brother first come to prominence, for when the pair learned who their mother was, they were shocked at the way in which Sidero acted towards her. The two brothers sought to kill Sidero, and despite Tyro’s stepmother seeking sanctuary in a temple dedicated to Hera in Elis, Pelias would strike a killing blow. This act of sacrilege would create an enemy of Hera, but in the short term, all seemed to be going well for Pelias. Pelias and Neleus would go their separate ways, with Pelias returning to Iolcus; and their Pelias discovered that Cretheus had died. Now Aeson was the rightful heir to the throne, but Pelias instead seize the throne through force, and imprisoned his stepbrother in one of the palace’s dungeons. Pelias ruled as King of Iolcus, and married Anaxibia, the daughter of a king of Argos, Bia. Anaxibia would give birth to a number of children for Pelias, including the likes of Acastus, Alcestis, Amphinome, Antinoe, Asteropaea, Evadne, Hippothoe, Pelopia, and Pisidice. The daughter of Pelias would be known as the Peliades, although it is the son of Pelias, Acastus, who is most famous as an individual. At the same time that Pelias was raising a family, Aeson, locked away in the dungeon was doing likewise, for he had wed, possibly a woman by the name of Polymede, who had given him two sons, Jason and Promachus. Promachus was killed by Pelias as a future threat to his position, but Jason was smuggled away to the care of the centaur Chiron before he was discovered. Despite now believing that there were no threats to him in Iolcus, Pelias was far from secure in his position and so the king consulted an Oracle. The prophetess would warn him about the dangers posed by a man wearing one sandal; a prophecy that didn’t seem to make much sense at the time. Years later though, Pelias announced his intention to make a spectacular sacrifice to Poseidon, and people came form far and wide to witness the event. One such person who travelled to Iolcus was the grown up Jason, and indeed Jason arrived in the realm of Pelias devoid of one sandal, having lost it crossing a river. Pelias quickly became aware of the stranger with one sandal, and soon ascertained that Jason was the son of Aeson, and therefore a real danger to his position as king. Pelias though devised a plan to rid himself of his rival, and quested Jason with the recovery of the Golden Fleece from Colchis, a seemingly deadly and impossible task, although it might have been Jason himself who suggested the quest. Pelias though seemingly agreed to give up the throne if Jason returned with the Golden Fleece. Jason was being guided by the goddess Hera, and soon he had a vessel, the Argo, constructed and a band of heroes gathered to crew the ship. The son of Pelias, Acastus, was amongst the crew, and was worthy of his spot. After many adventures Jason and the Argo returned to Iolcus with the Golden Fleece, and perhaps more important, with Medea, the sorceress daughter of Aeetes. The return of Jason though was not quick enough for his family, for believing that their son had died, Aeson drank bull’s blood as a poison and died, whilst Jason’s mother hanged herself. So Jason returned with quest accomplished but soon found out about the tragic deaths of his parents; and despite being in possession of the Golden Fleece, Pelias was not willing to give up the throne. Jason therefore either instigated his revenge, or Medea, his new wife, took it upon herself to gain vengeance. Medea took the daughters of Pelias to one side, and showed them how she could rejuvenate an old ram into a new lamb, simply by cutting it up, adding some herbs and boiling it, and indeed a new lamb did emerge from the pot when Medea completed the spell. Medea then told the Peliades, that she could do the same for Pelias, returning him to a vigorous, youthful version of himself. 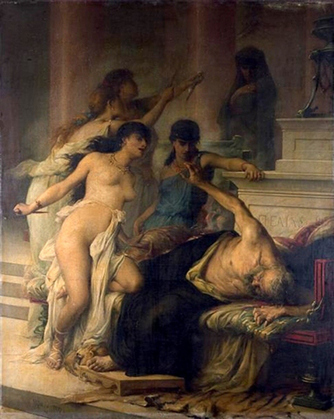 Thus, the daughters of Pelias dismembered their father, and threw the pieces into a large cauldron, of course, a youthful Pelias did not emerge from the pot regicide and patricide the daughters fled the kingdom, and subsequently settled in Arcadia. The throne of Iolcus was now vacant, but Jason would not be made king, for even if he and Medea had not committed regicide, they had certainly instigated, and so Acastus became king of Iolcus, and banished Medea and Jason from the kingdom. The line of Pelias though did not remain on the throne long for Acastus himself was later overthrown by a combined force led by Jason and ﻿Peleus﻿, with Jason’s son, Thessalus, placed on the throne instead.